Shabbychick Junk. 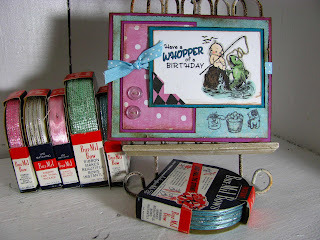 : Have a Whopper of a Birthday! I just discovered something really cool about blogger...you can 'schedule' posts to publish when you're not here! WHO KNEW! 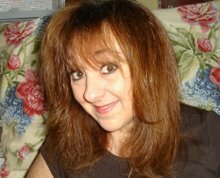 I've only been blogging for, ah, a year and a half and I just discovered this! For all of you bloggers out there, you can 'schedule' a post to automatically go up on a date and time you specify, by clicking on "post options". Put in your post date and time and you're done....YEP, I'M TECH SAVVY! *NOT*! Anyway, I'm testing this out this week just in case my laptop plan doesnt work and I can't get a signal from the cabin. 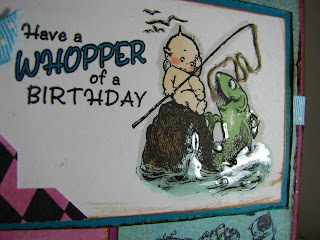 This stamp is from Crafty Secret's "Fishing Buds" stamp set. I colored kewpie in with skin white, and the fish with spring dim green. The fun part of this card was that I used crystal effects (diamond glaze) to coat the water so it looks shiny and splashy on the card! I also took string and glued it to the fish line so the fishline has texture. I used a stampin up corner punch to punch out the purple corners. thanks for the tip. Hey thanks for the birthday card. tomorrow is my day & I'll have a whopper of a day! I thought this set was cute but haven't bought it ....BUT you just made it even cuter. I think I need it now.Thanks for all you do and sharing your talent.